Happy Book Birthday to Jared Yates Sexton’s I Am the Oil of the Engine of the World, his second collection from Split Lip. We are thrilled to be able to put this weird + wonderful stories out into the world. Here is a clip of Jared reading one of the stories, You Are But a Pilgrim Venturing to a Strange and Honest Land, originally published in Cleaver Magazine. The book is now available through Split Lip (buy directly and support small presses) or Amazon, and you can save it and review it on Goodreads. Or if you’re a book reviewer for a blog or journal, we’d be happy to send you a .pdf or hard copy–just drop us a request: editor@splitlipmagazine.com. Thank you for reading and supporting our authors and books! Keep an eye on our social media accounts all day long for a chance to win a I Am the Oil of the Engine of the World Leap Day Grab Bag, that includes a signed copy of the book, Split Lip swag, and other surprises. Also: Jared will be on a panel at the upcoming Voices of the Middle West 2016 and at AWP 2016 in Los Angeles (w/ BULL and Split Lip at Table #233 and at our reading w/ Little Fiction/Big Truths). Be sure to shake his hand–and get his book if you haven’t yet. Hey folks. I’ve been seeing some heartbreaking headlines posted all over social media regarding the University of Akron’s potential to close its book press and couldn’t help but to post an open letter to its top administrators: Scott Scarborough (President), Lawrence Burns (Vice President of Advancement), Mike Sherman (Senior Vice President, Provost & Chief Operating Officer), and Paul Herold (Secretary of the Board of Trustees). It’s posted below. If you feel inclined to learn more and see what you can do to help keep the book press in biz, visit the Save The University of Akron Press’ Facebook Page! I am writing with uniformed concern for the University of Akron’s book press, and I say uninformed because I am unaware of the school’s situation in full, and, though a bit speculative, I frankly believe media outlets suppress facts to produce more persuasive journalism. If, however, recent headlines are accurate regarding University of Akron’s plans to halt its book press funding, then I am obligated to ask: would you please consider other means to transpose the institution’s budget from deficit to reclamation? Akron’s book press has been an essential contributor to the literary arts for thirty years, and its most notable effort, I’d argue, is the esteemed Akron Series in Poetry. On the one hand, through an entrepreneurial lens, I can see how one may justify considering poetry an expense worth omitting since, as a product, it has very little monetary value, and its supply trumps its demand. On the other hand, through an academic lens, there is a fundamental need to preserve and respect poetry since it cannot be forgotten the arts are precursors of the sciences, and if academia believes the arts have been exhausted to the extent of futility, then the academy is, in fact, blaspheming its own being. The first and foremost duty of academia is to embrace and respect preexisting knowledge, to shelter it in order to promote research and discovery and/or creation of yet-to-exist knowledge. Poetry of the past must remain in the proverbial knowledge arsenal, and the poetry of contemporary thinkers that has yet to be written and/or published must remain in the academy’s diet for even more knowledge. The academy must stay hungry for knowledge and remember an appetite for profit belongs to the entrepreneur’s diet. While I can respect the business component of university operations, I cannot say I fully understand it since I am a romantic with a fervent desire for academia to get reacquainted with its roots, or to at least aim effort toward doing so. There are valid reasons, I’m sure, that the academy has been pressed to take a more corporate approach to operations, but there has got to be a way to balance things and take a reformative approach rather than a transformative approach by remembering knowledge stockpiles as a result of synergy between multiple domains in both the sciences and the arts. You claim to function as a polytechnic university––an admirable approach. Your website even defines it to an etymological level: Polytechnic = Polutekhnos, which is Polu (many) + tekhné (arts). By cutting the book press, it seems your approach will deflate to: Ligótera (fewer) + tekhné (arts). Please be kind to your reputation and maintain the purity of your polytechnic approach by preserving your book press. 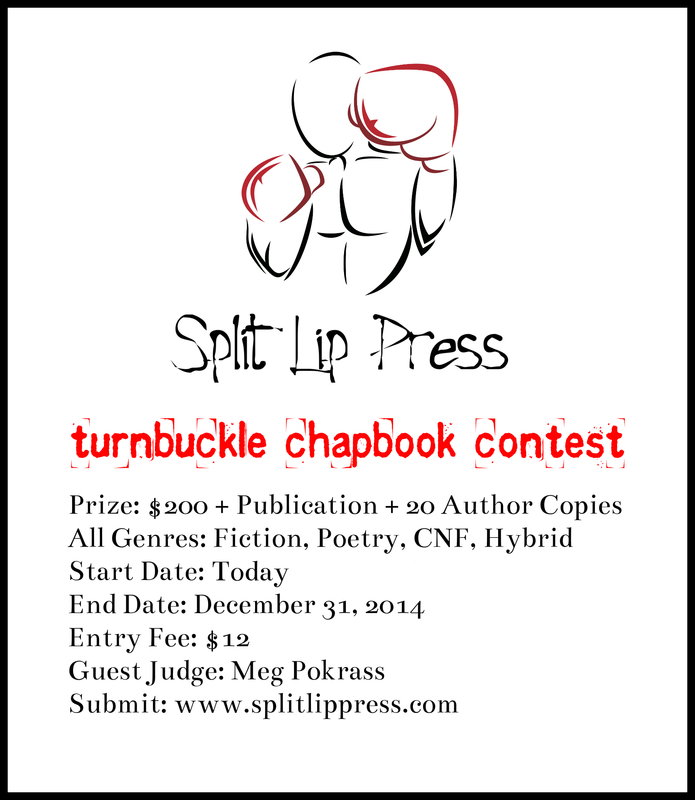 Katie Schmid Wins the Turnbuckle Chapbook Contest! Though Split Lip Press does not condone or promote smoking cigarettes, take a look at this pic of Katie Schmid, winning author of our Turnbuckle Chapbook Contest with her manuscript Forget Me / Hit Me / Let Me Drink Great Quantities of Clear, Evil Liquor. 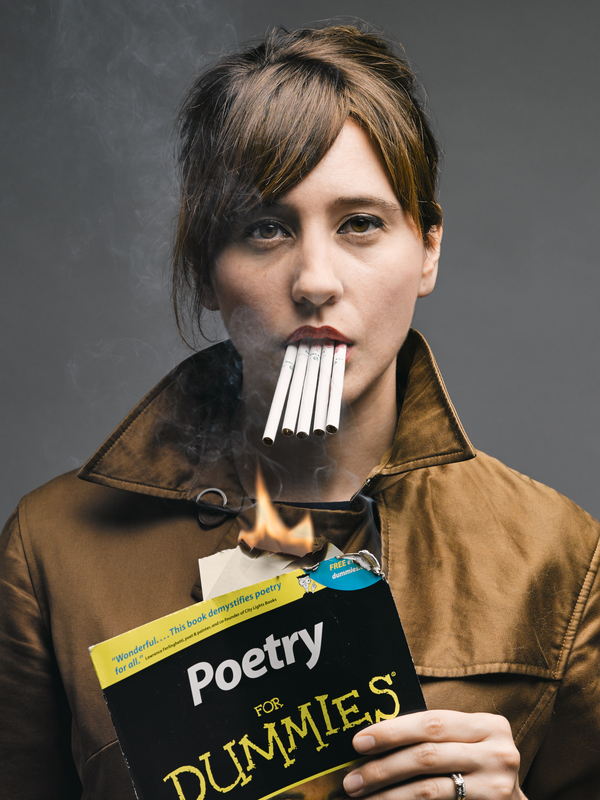 Such a cool photo, but even cooler, her book tentatively forthcoming sometime in late summer. Stand by for the official release date announcement. Boys pay tribute to Saint Jude: patron saint of dollar single cigarettes from the bar, patron saint of working a double at the granite factory, patron saint of watching the bitter candle of your father going to hell. Dear god, the escalation: a gritty denotation of the Saint Jude figure. Beautifully tragic in my opinion. Rock n Roll, Split Lip fans. We appreciate your support and look forward to bringing you Katie’s book Forget Me / Hit Me / Let Me Drink Great Quantities of Clear, Evil Liquor this coming summer. 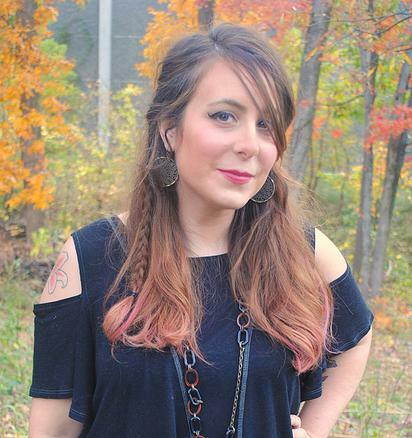 After searching for a significant period of time, and as we waited patiently for the perfect person for the job, Amanda Miska was recruited to serve as Split Lip Magazine’s Editor-in-Chief in December, 2014. She joined with her fists up throwing brass knuckle punches with all sorts of plans to push Split Lip to its next level. She is the former fiction curator at Luna Luna Magazine, one of the most visited online magazines out there, and one that also features media outside of literature like music, fine art and film. Split Lip’s perfect fit. Amanda received her MFA in Creative Writing from American University. Her work is all over the place in fine journals like Whiskey Paper, CHEAP POP, jmww, The Collapsar, Storychord, Five Quarterly, Cactus Heart, Lockjaw Magazine, Pea River Journal, Hippocampus Magazine, Cartridge Lit, Atticus Review and elsewhere. She lives and writes in the Northern part of Virginia, but you can find her procrastinating on Twitter: @akmiska. 4 Books Publishedin One Month? Unheard of. I’ve been a fan of Kristina Marie Darling for a couple of years ever since poet David Tomaloff turned me onto her work. As a writer who favors short fiction by folks like Richard Yates and Raymond Carver, and poetry by folks like Stephen Dobyns and Richard Hugo, it’s kind of surprising I’m a fan of Darling’s approach to writing. It was weird. She sent me a review copy of Brushes with, and though intimidated by its cerebral nature, I dug in. I mean, I really, really dug in. Her work makes me want to read closely and critically, something I’d rather not do with most poetry. Whatever she’s doing, and despite my poor interpretations of her material, it’s working in her favor. She’s on fire, too! 17 published books with 3 more forthcoming. Let’s ask a couple of questions and see what’s up with her. So, congratulations on your newest three books! When can we expect their release? What can you tell us about each title? First, thank you for the kind words about my work! 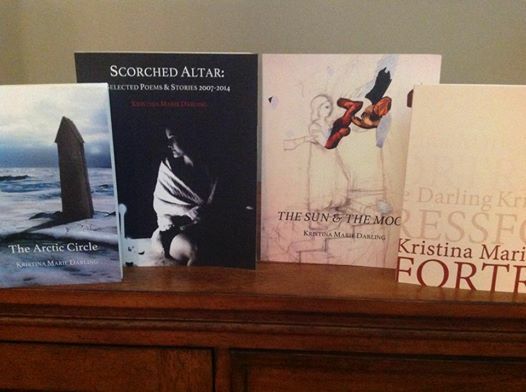 Although I’m excited about all three of these new releases, I’m especially thrilled about the publication of Scorched Altar: Selected Poems and Stories 2007-2014. The book includes excerpts of my previous collections, which include Night Songs, Compendium, The Body is a Little Gilded Cage, Petrarchan, Vow, and more. Scorched Altar is available from BlazeVOX Books and can be purchased here. I’m also delighted about the publication of my flash fiction collection, The Arctic Circle, which is available from BlazeVOX Books too. The collection includes linked stories about a woman who gets married to the man of her dreams… only to find that his first wife was found frozen inside the house. A short excerpt from the manuscript is online at Tupelo Quarterly. Get your copy of the book here. Lastly, I’m so happy to see my collection of astronomy poems in print. The Sun & the Moon is available from BlazeVOX Books, and invokes the astronomical clock as its central metaphor. As the book unfolds, a marriage between astral bodies crumbles, and the constellations become into ghosts, their dresses covered in ice. The book is available here. It’s worth purchasing even if only for Noah Saterstrom’s beautiful cover art. I hope you’ll check out any or all of these new books! I’ve seen several different sides of your writing. I mean, you’ve done straight narrative like the lovely “Self Portrait, Evicted.” Erasures as found in some of your books. Then you do footnotes, glossaries and whatnot like “A History of Transcendence.” Now I’ve been hearing about all sorts of hybrid work you’re putting out. Tell us. Why do you seem to be interested in everything poetically possible? How do you afford your voice to so many different writing methodologies? That’s a great question. For me, each book is its own idea, its own concept, so it usually calls for a style that’s different from the ways I’ve written before. This is good because it keeps me from getting too comfortable in any one way of writing. The poems I’m the happiest with usually feels like a process of discovery while I’m writing them. I have no idea where the poem, the idea, or the style of writing will take me. Because each book is its own idea, though, that means that the prospect of starting a new project is very intimidating. But once I do, watch out! That project usually takes over my life until it’s finished. With a publication history of now 20 books and a CV that contends with the length of the old testament, how do you manage to get it all done? The writing, the revising, the editing, the submission process, reaching out for reviews, et cetera. I get asked that question a lot, and the answer is always the same: I don’t have a one-year old baby. I have a one-year old nephew. If I were a parent, I think my priorities would be much different, and poetry would take a back seat. But for now, I can have fun with my adorable nephew and still write tons of poems. It’s good to publish in magazines that are attached to small presses. Like Thrush Journal and Thrush Press. Or Prick of the Spindle and Aqueous Books. Or BlazeVOX Journal and BlazeVOX Books. Or Anemone Sidecar and Ravenna Press. And Wicked Alice and Dancing Girl press for the ladies. The list goes on and on. But it’s always great to test the waters with a magazine submission, then build a relationship with the editors, and later approach them with a manuscript. At least, that’s how it worked for me. I was a contributor to the Gold Wake Press E-Chaps Series for years, and when the editors started a print series, they graciously agreed to take a look at my project. Now that you have all of those books, are in the process of earning your Ph.D. in poetics, and get a billion search results when Googling your name, what’s next for KMD? Gainful employment, hopefully. I’m finishing up school, traveling, and getting ready to apply for jobs. I’m hoping to find something that’s a mix of teaching and editing, but I’m open to many different possibilities: curriculum development, arts management, higher education administration, or just about anything else that involves books. One last question. A fun one. Would you ever consider writing a mainstream or young adult novel? I’m asking since your career reminds me of Julianna Baggott’s, who has 18 published books of poetry, commercial novels and children’s books. Is that a realm you think you’ll ever enter? I heard there’s money in it. Imagine it–– “Footnotes to Hunger Games,” a trilogy by Kristina Marie Darling. First: Thank you for the flattering comparison! I love Julianna Baggott’s work. Second: You are a mind reader! I’m working on a novel about a woman who’s in love but can’t speak. It’s called Frances the Mute. Because I never really stopped being a teenager, I have a feeling that the book is something teenage girls would really love. Hopefully once I get a working draft in order, anything will be possible. So, we’ve got this going on. Give it some thought and submit your chapbook manuscript!